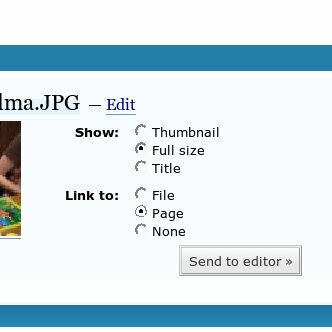 I wrote this plugin to deal with a common complaint from my clients: when uploading pictures in WordPress and sending them to the editor, one has to repeatedly re-select how the image should appear. In the case of the screenshot below, I checked “Show: Full size” and “Link to: Page.” This can get tedious if you have to upload a bunch of images. This plugin remembers your settings for the next time you upload. Download and unzip this plugin. file in your /wp-content/plugins/ directory, and activate it. If you have any complaints, questions, or suggestions concerning this plugin, please leave a comment below, send me an email at if.website (located at) gmail (dot) com or open a ticket in my support forum. This entry was written by filosofo, posted on October 30, 2007 at 1:01 am, filed under WordPress and tagged Attachments, plugin. Bookmark the permalink. Follow any comments here with the RSS feed for this post. Post a comment or leave a trackback: Trackback URL. this so totally rocks up wordpress. great contribution!